Merrimac sits under the couch top basking spot. 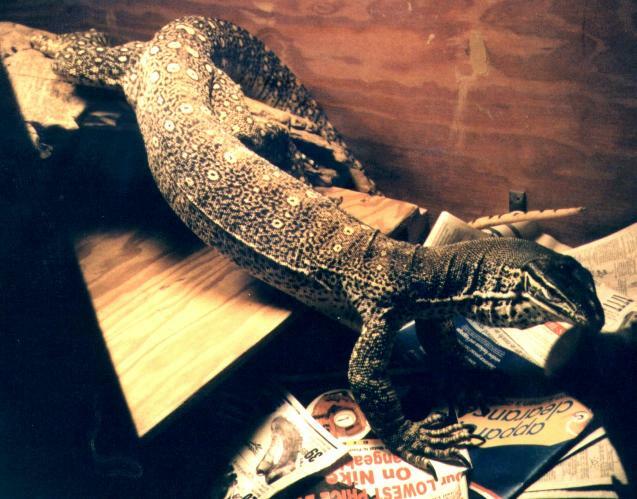 On a trip to Berkeley's East Bay Vivarium in February 1999, I purchased Merrimac, a moderate sized male argus monitor. He was packed up in a large crate and driven back to Seattle. When I introduced him to Oz, they immediately started courting and mating, and continued for several days. As of this writing, I have not had Merrimac for very long, so he does not have much of a story to be told. He is a nicely patterned, well formed male, not nearly so large as Hall. Of some concern is the fact that he has not been flicking his tongue. He makes all the motions of a monitor flicking its tongue in and out, but no tongue comes out. He seems to be eating, drinking, and mating quite well without it, however. Although Merrimac and Oz seem to get along quite well, Merrimac and Chris do not! I tried to introduce them once, and Chris came over and tried to bite Merrimac. This is typical in female-female combat among monitors. Merrimac responded by raising up into a bipedal wrestling pose and Chris accepted his challenge. The two of them performed an awesome display of ritual wreslting for the dominance position right there in front of me. 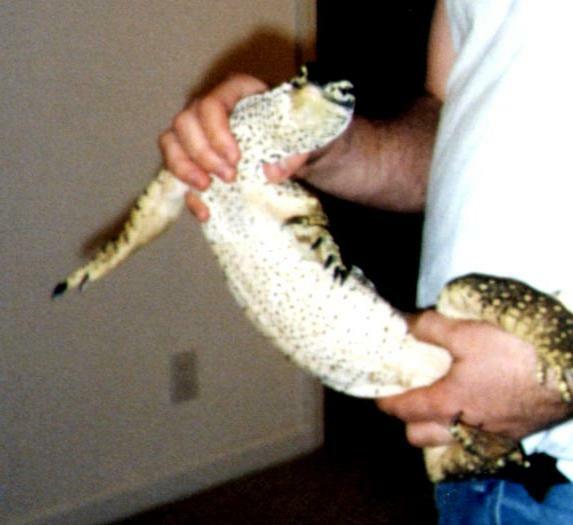 For those not familiar with the varanid ritual wrestling, it is a form of ritual combat usually undertaken by two males so as to reduce the chance that one of them will get badly hurt in an actual fight using the teeth. It is very much like the human sport judo, where both contestants start off standing and attempt to throw the other to the ground and pin him or her or otherwise force submission. Monitors have a definite advantage over human judoka however, because they can use their tail for ballance as well as their hind legs. Merrimac and Chris wrestled around for a minute or more, but for all Chris's ferocity, Merrimac's greater size and strength won out in the end. After Merrimac showed he was clearly the stronger of the two, Chris ran off, dashing about the room with Merrimac in hot pursuit as he reinforced his dominant position. Finally, Chris was able to escape and hide and I was able to pick up Merrimac and return him to Oz's enclosure. Since I am housing Merrimac with Oz, I have to separate them to feed them. Merrimac soon learned that he would be fed when he was picked up. Now, when he sees my gloved hands descending into his cage, he leaps up into my arms and begins visciously biting just about anything he sees. I thought that the thick leather welder's gloves I bought to protect against Hall would offer adequate protection against the smaller Merrimac. However, no one seems to have told Merrimac this. Earlier today (March 2, 1999) Merrimac tried to kill my gloved hands. He bit, and once he got a solid bite he would thrash about. I decided to let him try this, since I was confident he could do no harm. I was slightly curious what those sharp sensations were that I was getting through the thick cowhide, kevlar, and padding, but didn't pay them much mind. Only later, when I put Merrimac back in his cage and took off the gloves, did I find that one of my fingers had sustained a 1 centimeter long, shallow cut from one of Merrimac's teeth. Astounded, I took a closer look at the gloves. They were shredded! Huge gashes had been cut through the leather, many centimeters in length. Fortunately, they provided enough protection that the only wound that got through was quite shallow and superficial, and didn't even result in much bleeding. I hate to think of the condition of my hands had I not had that armor, however. April 27, 1999 Merrimac and Oz seem to be settling in just fine after the move. It did not take either of them long to adjust to their new surrounds. Merrimac still has as much bad attitude, and hunger, as ever. May 7, 1999 Keeping Merrimac with Oz can sometimes pose problems. 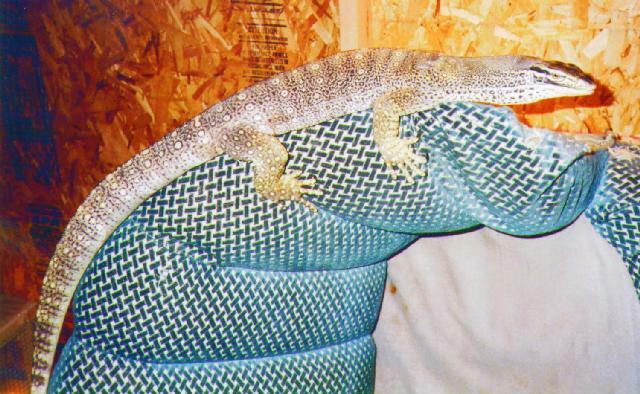 Male monitors are known to eat the eggs that their mates lay, if they can find them, and Merrimac is just the kind of guy who would do this. To prevent Merrimac from devouring a recent clutch of Oz's eggs, I decided to feed him so much that he litterally couldn't eat any more. I went down to the local supermarket and bought a pack of chicken gizzards and a pack of chicken fryer wings - the cheapest bulk meats I could find other than hamburger (which is to high in fat for me to feel comfortable feeding it to the monitors). Merrimac ate three large chicken wings, the last one of which wouldn't fit in his stomach, so he just sat there with the wing stretched down his throat and the tip sticking out of his mouth. The next day, Merrimac was so bloated he didn't want to move, much less eat. He just sat there on his heat mat digesting while Oz layed her eggs. Another problem with Merrimac is that he is so aggressive that it is difficult to clean his cage. As soon as you step inside, he tries to attack you! Thus, you have to spend your time grappling with him and trying to restrain him, leaving no hands left over for cleaning. I usually get around the problem by putting him in a pillowcase and tying the top closed, and only letting him out again once the cage is clean. Oct 1, 1999 In the eight months or so that I have had him, Merrimac has undergone a major change in temperment. Instead of the agressive, nearly unhandleable animal that you have been reading about up until now, Merrimac has become calm and tractable around me. I can pick him up without resistance, or at most a token hiss, and he is calm and composed when held. He makes no attempt to scratch, bite, or escape. 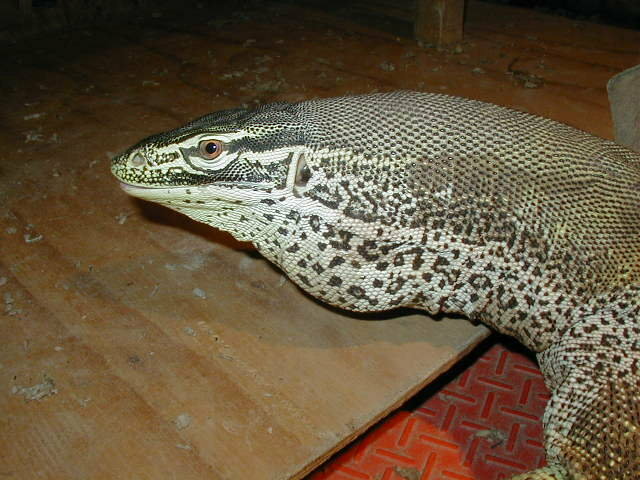 At this time, he is my tamest argus monitor. All this, and I have never attempted to tame him. He just got used to me durring the daily feeding and cage cleaning sessions. I rarely pick him up except to return him to his cage after feeding, and even then, I prefer to lure him back into his cage with a tidbit of food. Handling and close contact do not seem to be neccessary to tame a monitor, just respect and a non-threatening presence. 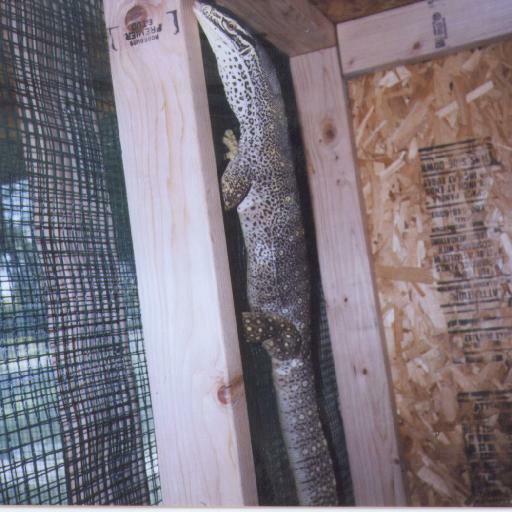 This also seems to illustrate the difference in temperment between captive bred and wild caught monitors. 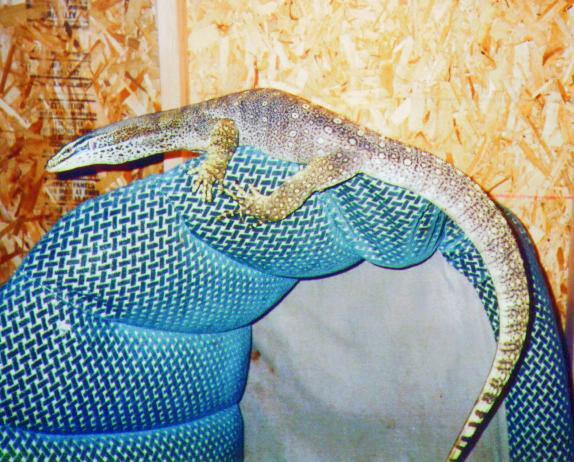 Merrimac and Chris are both known captive bred monitors. The true origins of Hall and Oz are unknown, so they were probably wild caught imports. Both Chris and Merrimac have become accustomed to humans and show little fear. They can be handled without much trouble or struggle (though care should be excercized when first picking them up to avoid having fingers mistaken for food). Oz and Hall have become accustomed to my presence, as long as I am outside their cage and they are inside. Neither is easy to handle, both will squirm and scratch if picked up, and will attempt to flee and put on a big defensive display if approached. Merrimac in his old cage. Merrimac does not like to be held. Merrimac climbs the walls of his cage. Merrimac on the couch again. A head shot of Merrimac. An adult Merrimac resting on his hide box.